Disasters strike and we have to prepare. Much of responses to extreme emergency scenarios used to be a result of trial and error, and adhoc solution. The aftermath has been tremendously painful. For example, the total cost of simply fire in the United States is estimated at $329 billion, or roughly 2.1% of U.S. gross domestic product. This estimate includes human and economic losses, costs of the fire service, built-in fire protection, and costs associated with the insurance industry. More abrupt and devastating emergencies, such as, the costliest ever disaster Hurricane Katrina (August 2005) was estimated for up to $300 billion in direct damage and $1 trillion in total (i.e., including indirect) damage. To compare, the material damage of the Kobe earthquake (Japan) in January 1995 was about $100 billion. These numbers illustrate that adequate preparation before the disaster is critical for the nations. Creating a culture of preparedness is a necessity. Initiative and innovation ought to be rewarded. With each new disaster, our ability to respond has improved, based upon lessons learned and painful experience. Emergency response and disaster plans have become ever better, and together with enhanced training and disaster drills, the quality and effectiveness of emergency response has become continually improved. However much of this improvement has been incremental, and has not taken advantage of new cyber-physical systems technologies and tools that are now available. Key features of our approach comprise a common and shared responsibility among all stakeholders, including individuals, first responders, communities, and governments (at all levels)– enabled with the application of cyber-physical technology. We focus on building the stabilization and economic growth. As a consortium, we respond to the cross-domain issues and provide solutions that we would not have achieved in separation. In particular, we deploy ground and aerial robotics, human-in-the-loop telerobotics, advanced sensors, search and rescue dogs, adaptive electronic communications and computer-enabled optimal resource allocation—all in a coordinated and adaptable framework for smart emergency response. This includes the coordination of individuals who volunteer to assist or to provide needed resources (by authorizing and registering them), and integrating their efforts with established first responders and agencies. This is all enabled by contemporary communication tools (such as smart phones) and methods of social networking and crowd-sourcing, combined with technological innovations that allow for network communication even when infrastructure has been seriously degraded. 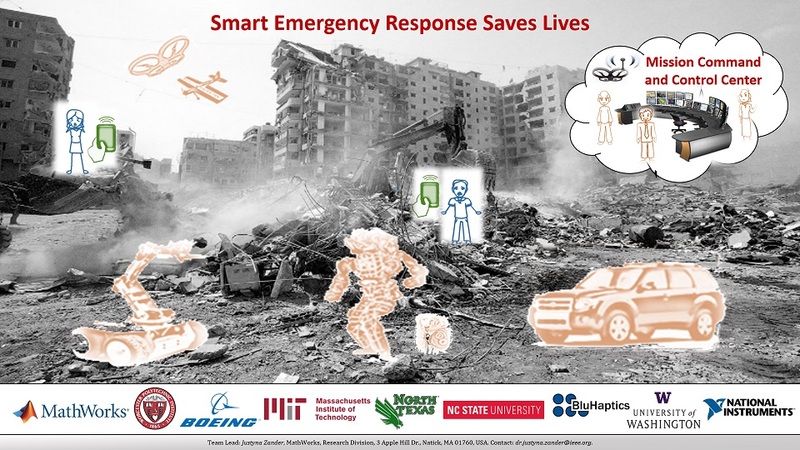 The Smart Emergency Response System (SERS) connects cyber-physical technologies with humans in the loop to save lives, rescue people, and attend to their critical needs when disaster strikes. SERS creates new employment opportunities for returning veterans as well as other unemployed, to accomplish remote tasks in remote or dangerous environments, using haptically-enabled teleoperation. SERS promotes opportunities for device app designers, developers, and grassroots entrepreneurs to grow new business models in communication, operations, and supply chain optimization. SERS automation, robotic and telerobotic technologies are expected to foster economic growth by increasing human productivity. Of particular note are capabilities to provide new opportunities for pollution cleanup, reduced environmental footprint, and transportation and delivery at reduced costs. A comprehensive story of SERS team by Justyna Zander can be found here.